Challenge Empty the Pantry continues! A day of excellent pantry cleaning followed a weekend away. It’s so handy to eat out of the pantry because I don’t need to go to the store to get groceries! I just eat what’s on the shelves. And since the hubby was away, I kept it simple today. First breakfast was toast from a loaf of bread in the freezer with some delicious creamed honey from the farmers’ market. I say first breakfast because the dear husband woke up at 5:00am to catch a 7:30am flight. Since I was already up, I decided to grab a bite and head into work early. Second breakfast was amazing oatmeal eaten at work. The picture might not do it justice, but here’s what’s in it. I mixed up all the dry ingredients in the plastic container and then added the wet ingredients and tossed it in my lunch bag. Once at work, I took off the lid and microwaved it for 3 minutes. It’s like having dessert for breakfast, but there’s oatmeal, so it’s healthy! I swear…. I meant to add some thawed frozen cherries, but I forgot, so I ate them separately. Lunch was straight from the freezer. I had a bowl of pumpkin, squash, and carrot soup I made a couple weeks ago. To dress it up, I added a veggie sausage that I nuked and cut up to add to the soup. The veggie sausage added the perfect flavor to the soup. And, it also came from the freezer! Perfect empty the pantry meal! A co-worker supplied a lovely complement of apple pie to my lunch, too! I love other people’s Thanksgiving leftovers. Dinner for one was delicious and inventive! 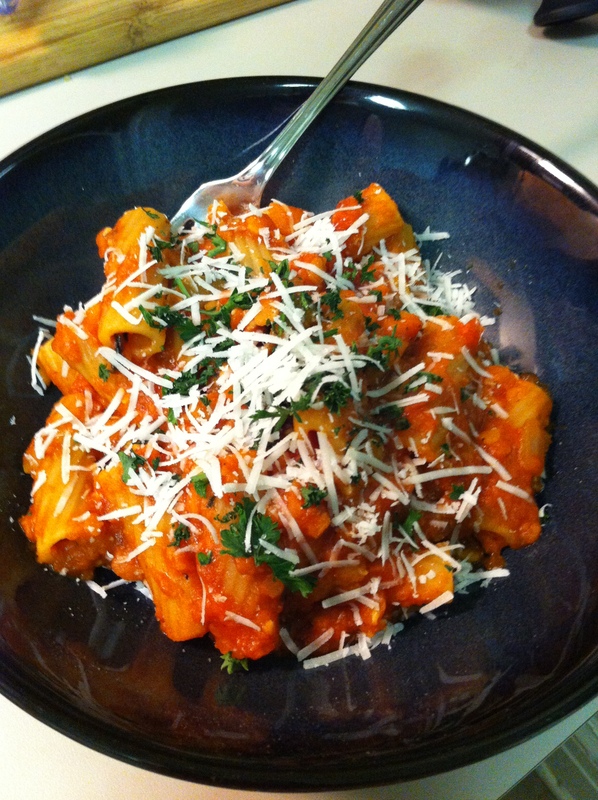 It started with dry pasta, red lentils, and a jar of marinara sauce. This is a simple kind of dinner that would baffle the dear husband because it involves more than two burners on the stove! 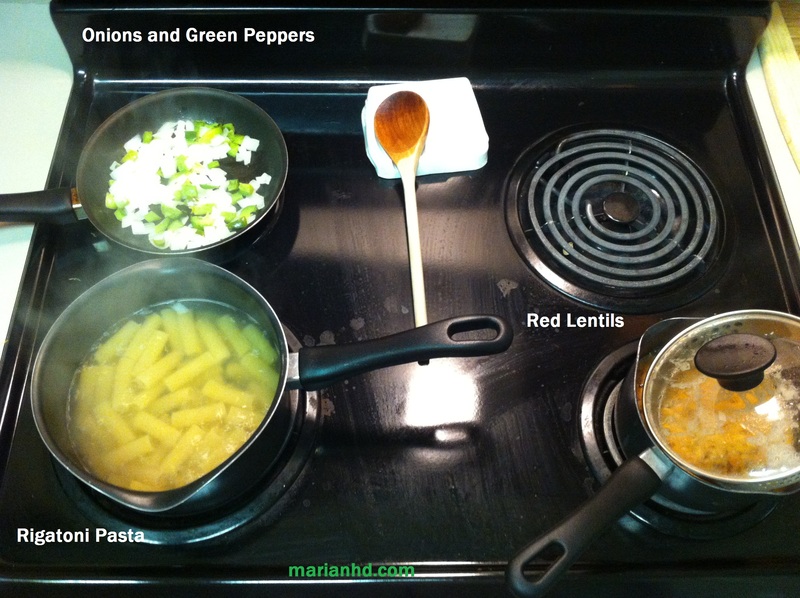 As the photo shows, I had onions and green peppers cooking in a pat of butter in a skillet, 2 servings of pasta boiling in salted water in the large saucepan, and 1/2 cup red lentils cooking in 1 1/4 cups water in the little saucepan. Not only did I juggle three things at once, I also made three dishes dirty! The pasta was cooked and drained, and then I added half a jar of pasta sauce to it. When the onions and peppers were cooked, I dumped those and 2 diced olives (I’m attempting to acquire a taste for olives and I’m starting small!) into the mix. When the lentils were done, they got dumped in, too. As you can tell, this was a very elegant and carefully planned meal. OR it was throw together based on what I could find. As usual. For beautiful presentation I chopped up some fresh parsley that is on about week 3 in the fridge and still kicking, and I grated a bit of Romano cheese on top. Add a sprinkle of salt, and voila! Dinner is served. Full disclosure: if I was to make this dish again on purpose, I would add 1/4 cup diced walnuts and I would use fresh basil instead of parsley. Otherwise, dead-on. Since I haven’t gotten groceries in a while, all of these ingredients came from the stockpile that needs to disappear. Lucky for me clearing out the pantry is still a delicious adventure! Stay tuned. There’s plenty of Dijon mustard and kidney beans that need to disappear in 4 weeks…. I think I’m going to do this, clear the pantry thing cause I have way too more food in my cabinets than money in the bank. Go for it! I strongly recommend starting by taking everything out of the cupboards and wiping them down and reorganizing everything. This forced me to own up to everything that was in there that can been forgotten about! I am ready! Let’s do it!